This morning, our fish team went to a small boatshed in Breaker Bay on Wellington’s south coast to pick up a great white shark. Not your normal morning mission and a bittersweet one at that as these creatures are endagered animals and a protected species. The shark had been ensnared in a fishing net and was dead by the time the fishermen had pulled it in. It took 6 of us to lift it into the truck and being that close to an animal gives you a true sense of what a beautiful and perfectly made for purpose these creatures are. The shark is 2.7 metres long so its tail fin didn’t quite fit as you can see in the picture below. 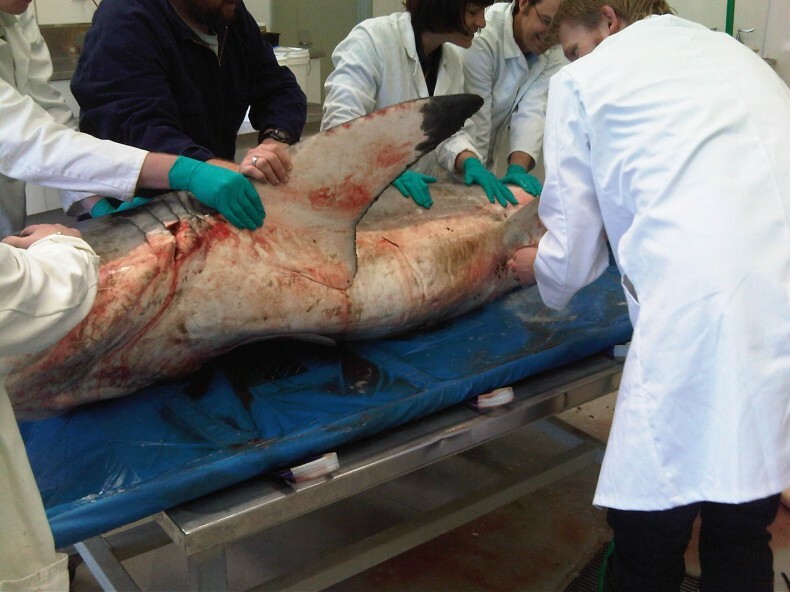 We had to carefully wrap the fin up for the trip back to Te Papa’s laboratories. Back at Te Papa, the team were able to give the specimen a wash and have a closer look. Andrew Stewart, Te Papa’s Fishes Collection Manager, says that the shark is an immature male and a rare specimen as the shark was on the cusp of moving from fish as its primary food source to marine mammmals. When we rolled the shark over to clean its underside, the scientists noticed small parasites which they collected for identification. The great white shark’s underside. Photo by Jane Keig. Parasites found on the shark. Photo by Jane Keig. These parasites were even found inside its mouth, buried into its gums and on its tongue. Andrew says that remora fish feed on these parasites – this shark is its own fully-functioning eco-system! 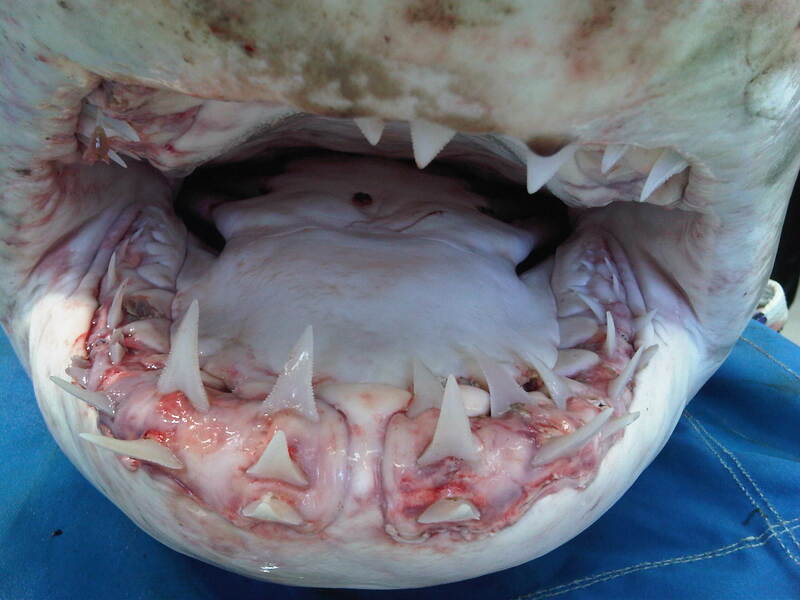 Inside the mouth of a great white shark. Photo by Jane Keig. The teeth look quite sharp and pointy but the points weren’t sharp to touch. The sides of the teeth are serrated and I was pretty happy a strong person was holding up the jaw when I took these photos! Sensory organs on the shark’s head. Photo by Jane Keig. 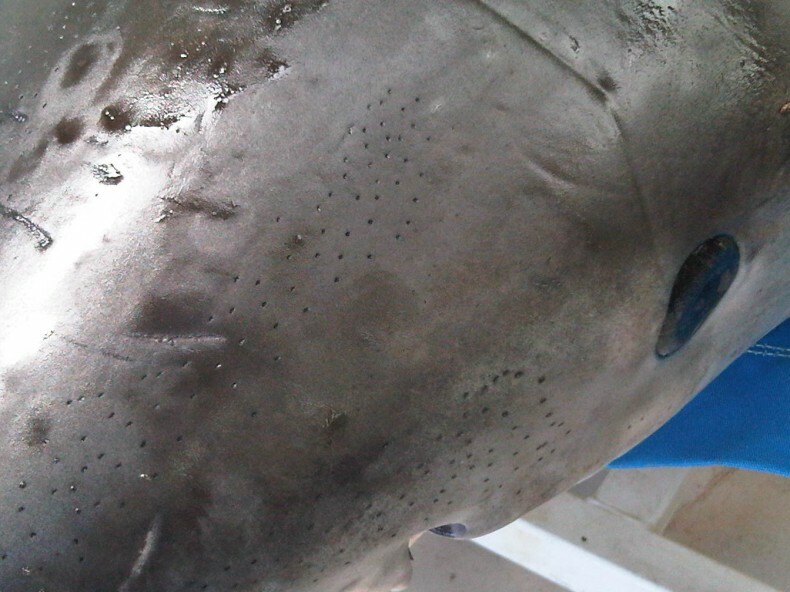 The shark’s nose and head are covered with jelly-filled sensory organs that look like freckles. These organs help it to sense electromagnetic pulses given off by its prey. I was amazed at how soft and velvety its skin felt, until I went against the grain and then it felt quite raspy. 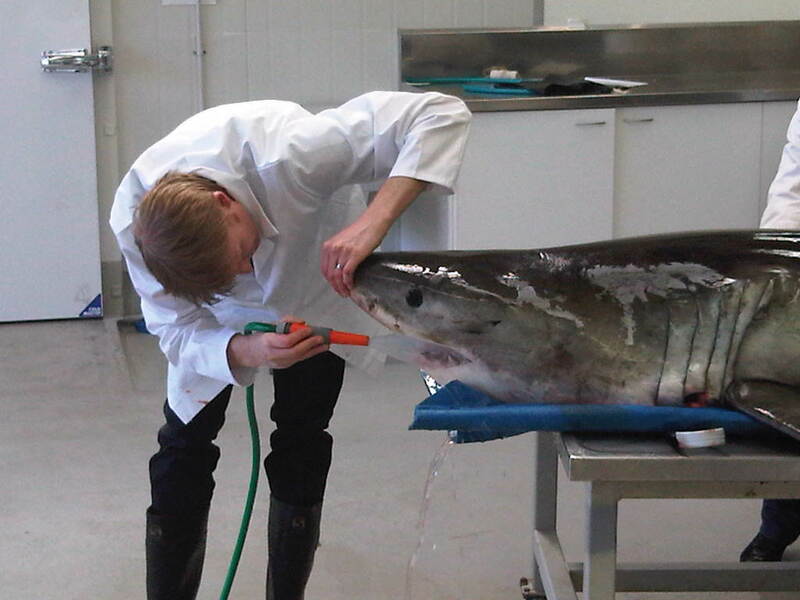 The shark will be frozen in our freezer to maintain the specimen’s integrity until further plans are confirmed. GWs ARE there in Wellington..just like most other places around New Zealand..West or East Coast (Bay of Plenty recently..6m+??). Although a “protected species” one ALWAYS has to be very aware that this is a predator in it’s own territory. You enter that territory at your own risk. NO shark “expert” can ever tell you otherwise..especially when you’ve been in the water with one. Like most wild animals/mammals..NEVER underestimate what they may do next. Just look on the web (for the recent attacks in Perth AUZ) to see their capability. A GW is a cunning shark that attacks, many times vertically (from below), and you never see it coming. How many other sharks attack like this? Time to “wake-up” for those who have little “real” experience with these fishes. Do GWs’ read “textbooks” or listen to “lectures”. LOL!! Time to get real. @Charlotte – we’re still working out what we’re going to be doing with this rare specimen,but will update you via the blog. 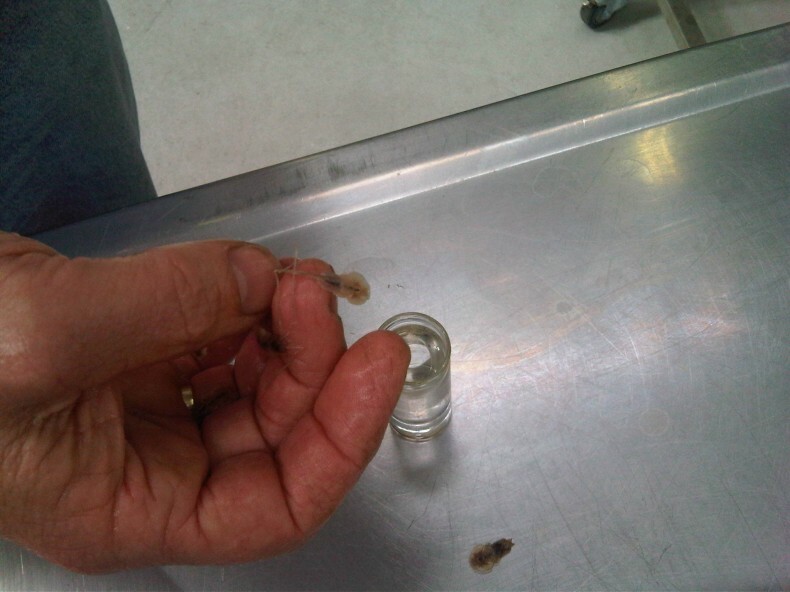 @olivia – yes, I did get to touch it, the skin was very much like touching velvet,not what I expected at all! The skin is made up of thousands of dermal denticles (literally “skin teeth”). Each denticle is similar to a tooth in that it has a pulpy cavity and it’s own blood supply and encased in an enamel-like coating. As if the shark didn’t have enough teeth in its mouth! Is this going to be on display in the museum? It looks freaky. Did you get to touch it and what did it feel like ?